First was the “WWE Kids” TV taping. 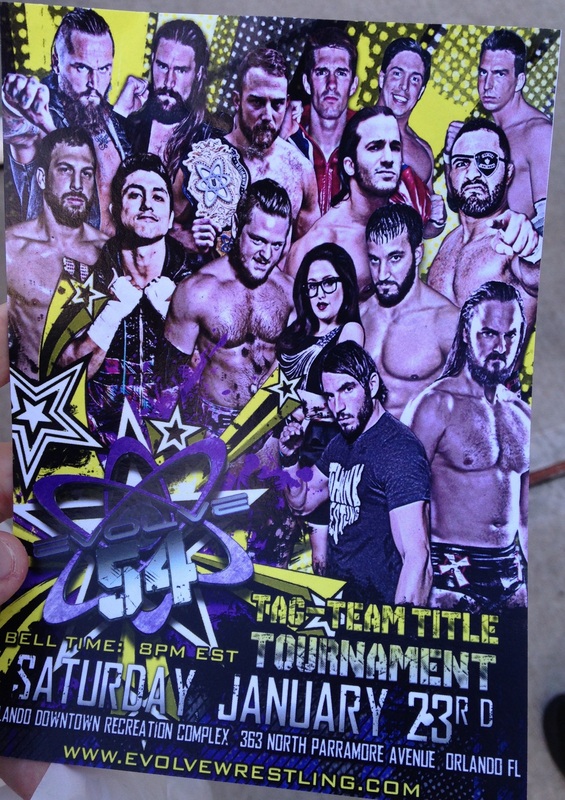 Also of note, there were flyers for upcoming EVOLVE shows included in NXT merchandise packs, pointing to the NXT-WWNLive relationship. (1) Tomasso Ciampa squashed Danny Burke. (2) NXT tag champions Dash & Dawson beat The Ascension. (3) Elias Samson squashed an unnamed jobber. (4) Carmella won a battle royal to become #1 contender to the Women’s Championships. Some shady eliminations set up an Asuka-Eva feud. (1) Sami Zayn beat Adam Rose. (2) Apollo Crews beat Tye Dillinger. Post-match, Crews issued a non-title challenge to NXT champion Finn Bálor to prove that he is good enough to be champion. (3) Baron Corbin beat Rich Swann. (4) NXT Women’s champion Bayley & Carmella beat Emma & Alexa Bliss. (5) Samoa Joe beat Johnny Gargano. (1) Jason Jordan & Chad Gable (now going by the team name “American Alpha”) beat Blake and Murphy. (2) Nia Jax beat Liv Morgan. (3) Alex Riley beat Bull Dempsey. (4) Sami Zayn vs. Baron Corbin vs. Samoa Joe went to an apparent No Contest in a #1 contender match when Corbin tapped to both men at the same time. Joe applied a cross-face while Sami applied a sharpshooter. (1) The Vaudevillains beat The Hype Bros. (Zack Ryder & Mojo Rawley). (3) Asuka squashed Santana Garrett. (4) NXT champion Finn Bálor beat Apollo Crews in a non-title match. No follow-up on the contendership situation or mention of the Bullet Club rumors (minus Finn making a gun gesture with his hand during the replays). I have a feeling they held a lot back tonight for the tapings in two weeks at the CFE Arena, which holds around 10,000 and is nearly sold out according to the box office.